The term “laser” stands for Light Amplification by Stimulated Emission of Radiation. Technically speaking, the laser is an instrument that emits photonic energy in the form of light. Lasers allow the dentist to treat most problems in a safe way, giving excellent results and providing better comfort for the patient. Yes, lasers have been used in dentistry since 1990. They can be used on their own, but often they used in combination with other dental instruments as a complementary technique in order to reach the best possible therapeutic result . Are there different kinds of laser? Yes, and they are characterized by the different wavelengths that makes them effective on different types of tissue: each kind of laser is more suited towards a specific therapy. There isn’t a single laser that can do everything! Which lasers are used in dentistry? Several lasers are used for treating the gums and oral mucosa (diode lasers, neodymium:YAG and CO2), others can treat gums as well as tooth and bone (erbium:YAG and erbium-chromium:YSGG). 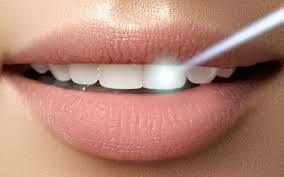 Some lasers are specifically suited towards tooth whitening (KTP and diode). What are the advantages in using the laser? The dentist can replace the use of a drill with the so-called “water laser”, the erbium laser, thus eliminating or reducing the need for anesthetic and offering the patient the most relaxing treatment possible. Use of the laser makes it possible to save teeth that are heavily decayed. Devitalization can be avoided thanks to the technique of laser-assisted dental pulp capping, which has a higher success rate than traditional techniques. The dentist can use the laser in place of the scalpel. In surgery, the laser offers good control over bleeding, and for this reason is the tool of choice for particular operations (fibromas, epulis, angiomas). Moreover, the laser significantly reduces both the symptoms and post-surgery recovery time, thanks to its effectiveness in reducing the amount of bacteria present in the gum and dental tissue and its biostimulating effects. If the laser is used according to the proper safety guidelines, and operated by a dentist trained in its use, it is an extremely safe instrument! In fact, in treatment of children it turns out to be much safer than traditional instruments due to its ability to focus on a tooth with selectivity (thus protecting the surrounding tissues, tongue and oral mucosa, from possible accidental traumas). Protective goggles must be worn at all times! Thanks to its many advantages, laser dentistry is the perfect solution for patients of all ages who are suffering from problems with teeth, gums, or the oral mucosa. It is particularly adept for treatment of children due to its comfort and safety and for more vulnerable adult patients, due to the high level of control offered over bleeding and post-surgical infections.